We didn't used to be all green and crunchy, but something about having a child makes one consider what kind of world he live in and will inherit. We keep the recycling bin from the trash company just outside our garage door, which is right off the kitchen. 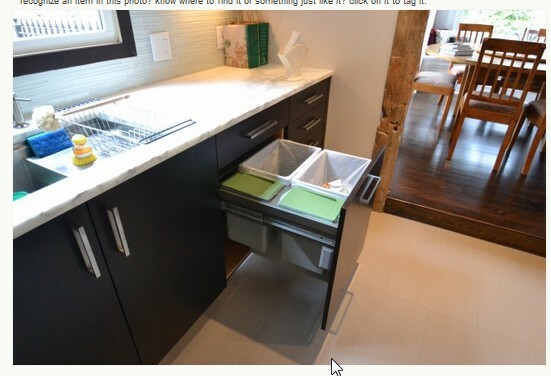 This works for us, and even our two-year-old knows that trash goes in the trash can (though he needs help with the step), food goes in the sink (for the disposal), and paper, plastic and glass go in the recycling container. It works for us. But, recycling is something we think about and there are times that recyclable items don't make it to the recycling bin because we don't want to take the extra steps to go to the garage. So, in the new house, we want to put all our recycling in a central place. Ideally, we want all the recycling "parts" in one spot. In other words, we don't have to open one door for trash and another for plastic. Hopefully, it we take that barrier away, more of our recyclable items will make it to the appropriate bin. This was our first choice. We saw it at Ikea and I started drooling. Who knew I could be so excited about trash. 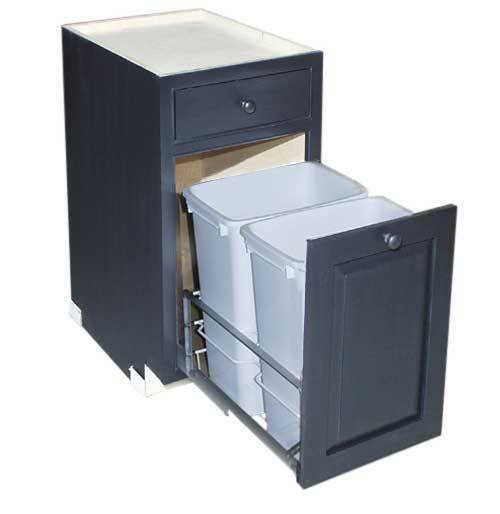 I liked that with one cabinet, you could house trash, plastic/glass and paper recycling. 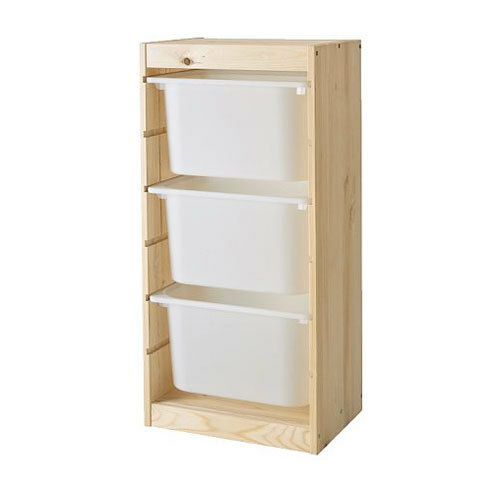 However, unless you buy Ikea cabinets, you have to spend custom cabinets to get this. Not totally opposed to that, but we decided to keep looking. Next, I thought of how big my pantry is going to be (9x9) and how maybe just putting the trash in there would be a good idea. This stacked toy bins (also from Ikea) could work. But you lose the convenience factor. This was our original solution. We liked way it used an awkward space, but ultimately our lazy susan is not in a convenient place in our kitchen. When we saw something like this in one of the cabinet books, we found our winner. It's very close in function to the Ikea one, but as a (close to) stock price. 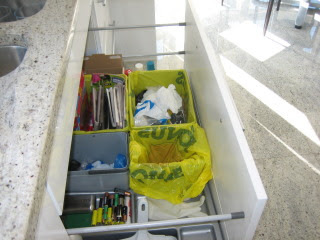 The trash and plastic/glass bins on the bottom pull-out, with the paper in the drawer on top. We'll have this pull-out on the end of the island, pulling toward the command center. This will make for easier access when sorting mail, bringing in groceries, or when we have company. 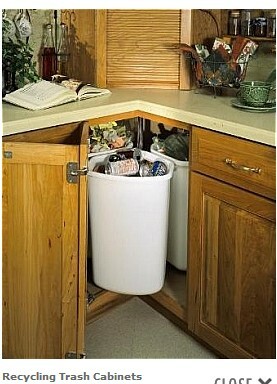 The recycling center can be accessed without going into the heart of the kitchen, and thus staying out of the cook's way! Since we tend to buy bulk items and use them out of bins, we don't have a lot of actual waste while I'm cooking, so the fact that it's not right in the kitchen is a non-issue. 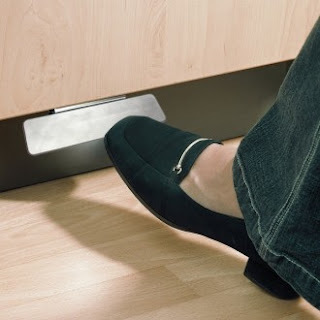 I found this fancy little gadget from Richelieu so we can can have a hands-free door. The #1 thing I will miss about our current trash can. Quick and dirty solution, from Ikea. 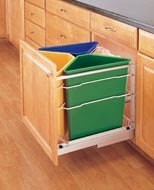 Do it yourself recycling center made from a base drawer. Perhaps a better garage idea. Not that we would ever have that much in one week! A solution if you don't have the cabinet/drawer space. I'm not sure what the two green bins are for...composting? This one is really cool for having everything in one drawer, but I don't think three equal sizes would work for us. Updated: We are so thrilled with the recycling center our carpenter created for us. It's touch-activated by Blum Servodrive, which means I don't have to open the door when I hands are full of yucky things. The top left bin holds odd recycling like batteries and bulbs. The top right bin holds paper recycling. The bottom left bin holds glass, cans, and plastic, along with the occasional large paper recycling. In our city, our recyclables go in the same tub. The bottom right bin is for regular trash. We love that recycling is so easy, even guests can recycle without much thought. Since we've moved in--after the initial unpacking clutter--we are happy that we are down to one bag of trash a week! 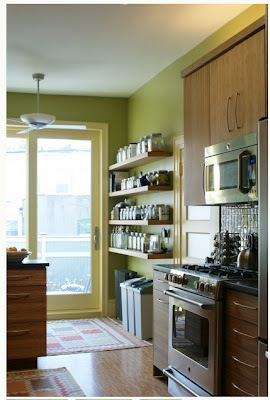 You can take a tour of our completed kitchen here.